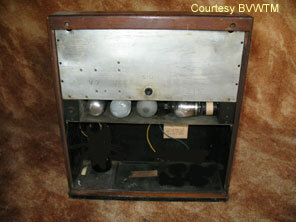 Shown here is the later version of the B4 radio. 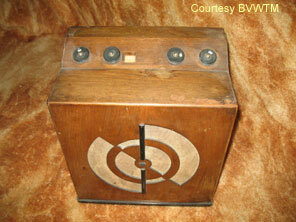 This transportable model features semi-concentric circles in the loudspeaker grille as opposed to the mirrored “M” of the very first Murphy radio. The area to the base of the cabinet would be where the H.T. high voltage battery and accumulator would have been situated. At the top right of the images above the following text is visible "Courtesy BVWTM". This insert appears on a few of the pictures in the Murphy section to acknowledge that the British Vintage Wireless And Television Museum in Dulwich has kindly provided access to their collection to enable some receivers I do not (or have not) personally own to appear on these pages in addition to the line drawings at the end of each year page.